A bill to stymie a class action lawsuit by workers with intellectual disabilities failed in 2014. The Australian government intends to revive it – but why? Josh Bornstein is a principal at law firm Maurice Blackburn, which is representing the class action. To be clear, all disabled people should be paid at least the minimum wage, without exception, and I accept it is offensive to suggest anything else. It is unimaginable that an Australian politician would say that employees with disabilities should be paid less than others. Yet some are paid as little as 9% of the minimum wage – or 99 cents/hour, $8/day, $40/week – including some who work for government-supported Australian disability enterprises. Over the last five years, some 10,000 employees with intellectual disabilities have sought to be paid more by pursuing a class action lawsuit. According to the federal and high courts, these employees have been illegally underpaid in breach of the Disability Discrimination Act for more than a decade. They are entitled to be compensated by the federal government. Instead, the government has done everything it can to block that effort. 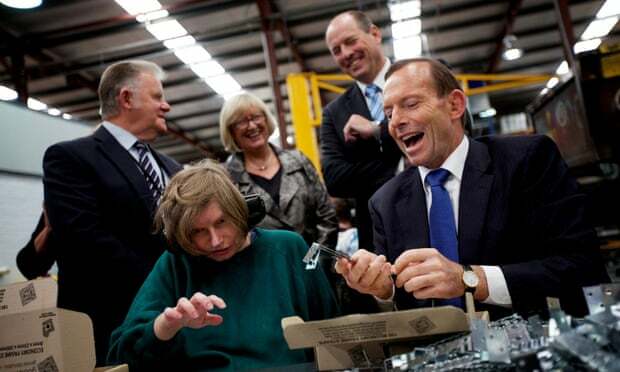 Just under half of Australians with disabilities live at or below the poverty line. For the 30% who can work, poverty wages are the norm. The quality of life of Australians with disabilities compares very badly with other developed countries; in fact, it ranks as one of the worst in the OECD. The platitudes about the Australian identity that invariably accompany each Australia Day – “generous”, “confident”, “assured of our place in the world” – are clearly not sourced from Australians with disabilities. Graeme Innes, the recently-sacked disability discrimination commissioner, described 2014 as an “annus horribilis”. Yooralla, the iconic disability services provider, was exposed for its elaborate attempts to hide and minimise the sexual abuse of its employees and clients. Stella Young, a fearless, outspoken advocate for Australians with disabilities and self-described “crip” died at age 32. A few days before Christmas, the federal government cut funding to disability advocacy groups including Blind Citizens of Australia and the Down Syndrome Association, hoping that no one would notice. It did so shortly after reneging on its commitment to reform multinational corporate tax avoidance, a multi-billion dollar industry. In November, the federal governmentbrought a bill before the Senate, designed to thwart the employees’ class action to recover their back pay. It was unprecedented; under the proposed law employees could accept half of their back pay in exchange for giving up their right to recover the other half. If they didn’t accept the offer, the government made it clear that it would continue to resist and delay the back pay claim in the courts for years. The carrot and the stick was being applied to those with intellectual disabilities. So in the lead-up to the Senate vote, my colleague Emeline Gaske and I joined with a band of small, under-resourced disability advocacy groups and tried our hand at political lobbying. Employees with disabilities don’t have a union of their own. Their pitifully low wages wouldn’t permit them to pay much in the way of dues, anyway. They are invisible to most and vulnerable to government mistreatment. Our coalition of would–be lobbyists sought to counter this dynamic by telling as many people as loudly as we could about the employees’ situation. The ALP supported the government’s bill until it came before the Senate, at which point our lobbying efforts thankfully bore fruit – they dropped their backing. The Greens staunchly opposed it too. We quickly realised that crossbench senators are routinely overwhelmed by the volume of proposed legislation foisted on them. They are susceptible to misinformation as they try to consider the merits of multiple proposals under time pressure. In order to counter the propaganda deployed by the government to sway their vote, we were forced to publicly issue a FAQ document. Long after we did so, Clive Palmer continued to repeat the government’s misinformation, claiming the employees would only recover half of their back pay in court after deductions for legal fees (false: it’s a pro bono case) and income tax (false: mostly the employees come under the income tax threshold). Jacqui Lambie, then still a PUP senator, parted ways with her colleagues and together with John Madigan and Nick Xenophon voted against the bill, which was defeated by one vote. Amid all of this grotesque hostility, the Senate vote was a small but significant victory. Regrettably, that is not the end of the matter. Within hours of the vote, Mitch Fifield resumed his lobbying of the crossbench senators, advising them that he would reintroduce the government bill in February 2015. And so once again, we await the government’s next move against Australians with disability.